This study abroad course will take students to the interior of the third pole, the Nepalese Himalayas, to learn about cultural landscape and environmental change. Participants will spend a few days in Kathmandu Valley, known for its historic sites, ancient temples, religious shrines, and captivating villages. Activities include a tour of the primeval city of Bhaktapur and Patan along with Kathmandu Durbar Square. Students will travel to the picturesque town of Pokhara and trek through Nepal’s largest protected range, Annapurna Conservation Area, where they will have a rare opportunity to interact with Pun communities and their agricultural practices in Sikha village nestled at the foot of Dhaulagiri and Annapurna peaks. A seven days’ trek will bring students through the interior of a temperate broad-leaved rain forest with breath-taking views of the tallest peaks in the world. 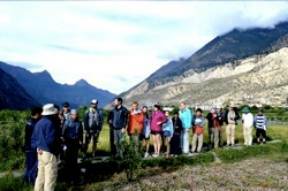 Participants will encounter the hidden Kingdom of Mustang and tour deep gorges and magnificent lakes with stunning views of the Himalayas from Pokhara, then return to Kathmandu for student presentations and a celebration in the evening. To download (PDF) a detailed brochure and registration form, click here. For more information, contact Dr. Mohan B. Dangi, mdangi@csufresno.edu or 559.278.4857.